One of the most eye-opening aspects of these deposits is the small tonneage that forms the Resource-base. Polymetallic deposits that lack precious metals are frequently only economic if there are large tonnages available (10-15 Mtonnes). Clearly, given that none of these Resources are over 5 Mtonnes, the deposits do not need to be “huge” – it is the grade of the deposits that matter. Keno Hill is the largest and it includes the collective inferred and indicated tonnage for five deposits, the largest of which is the Flame and Moth Deposit (3 & 6) at 1,638,000 tonnes Indicated and 348,000 Inferred. This deposit constitutes almost ½ of the total resources in the Keno Hill District. Thor is just over 1.0 Mtonnes I&I, and continues to be expanded. 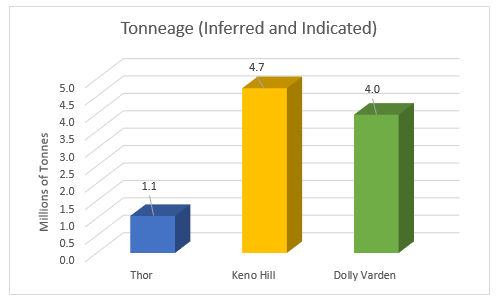 Dolly Varden is 4.0 Mtonnes and consists of 4 independent deposits. The largest of these deposits is Torbrit which forms approximately ½ of the known Resource and is almost 2 Mtonnes in size.